For five days, from September 13 to 17, 2017, leading policy makers, business leaders, scholars and other experts, gathered at this year’s Athens Democracy Forum to discuss – as the event’s main theme suggested – “solutions for a changing world”. The event was hosted at the Zappeion Exhibition Hall, Costa Navarino, and the Hotel Grande Bretagne, and organized by The International New York Times (NYT), under the auspices of the United Nations Democracy Fund, and the city of Athens. 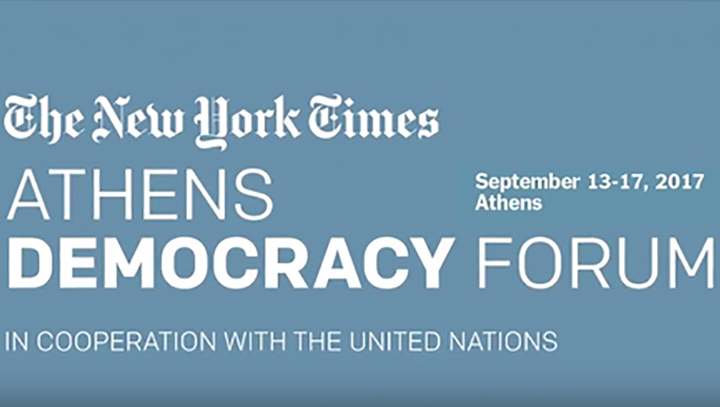 True to its tradition of supporting initiatives for a better world, Deree – The American College of Greece joined with the Global Liberal Arts Alliance (GLAA) as Education Partners for the International NYT Athens Democracy Forum. 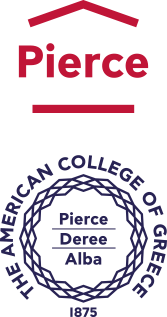 The Global Liberal Arts Alliance, is an organization of 29 American-style liberal arts institutions – including Deree – representing 17 nations, with the goal of supporting excellence in liberal arts education on a transnational basis. A group of 23 students representing 20 colleges of the GLAA in 11 countries, including two Deree students, attended the forum and actively engaged in a variety of events. The students were supervised by Deree Faculty, Dr. Antonis Klidas, and the Coordinator of the GLAA, Dr. Simon Gray. On Friday, September 15, four students participated in the Interactive Roundtable Discussion: Bridging the Generational Gap panel moderated by Katrin Bennhold, The New York Times Staff Correspondent. The “old generation” team was represented by Irina Bokova, General Director, UNESCO, Kerry Kennedy, President, Robert F. Kennedy Human Rights, and Brian Smith, President, Europe, Middle East and Africa Group of The Coca-Cola Company. The “old” and “new” generations explored the reasons why young people in Western societies are growing disinterested in the democratic process, from voting to civic engagement, and tried to come up with possible solutions and strategies for leaders and policy makers alike. On the same day, the students sat at the Sponsored UN Global Goals Interactive Lunch Round Tables panel, sponsored by the Marianna V. Vardinoyannis Foundation, and programmed by the European Bank of Reconstruction and Development, and the newDemocracy Foundation. The students were asked to record the conversation and frame important comments to be used in a summary report intended for the Athens Democracy Forum website. Congratulations to all students for participating and tackling some of the critical topics the world is facing in these challenging times!